Gridiron drama from director Oliver Stone looks at the on- and off-the-field struggles of the Miami Sharks, a once-mighty team struggling to get a playoff berth. 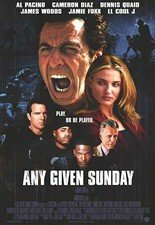 Veteran quarterback Dennis Quaid finds his spot threatened by flashy backup Jamie Foxx, while fiery coach Al Pacino's style is at odds with assistant Aaron Eckhart's tactics. Cameron Diaz, LL Cool J, Lauren Holly, James Woods, Ann-Margret, and Charlton Heston also star. 157 min. Widescreen (Enhanced); Soundtrack: English Dolby Digital 5.1; Subtitles: English, French; "making of" featurette; theatrical trailer; music video; filmographies; web links; scene access.